Now that it is October, I’ve been slowly putting out all of my fall decorations. I get really into decorating for fall because it makes me feel more festive, regardless of the temperature in Los Angeles. Every blog/ insta/ decorating site seems to be talking about how to decorate for fall. I love a good arts and crafts project, but I just haven’t been feeling many ideas this year. 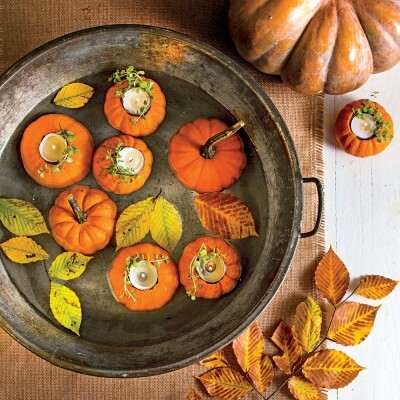 I LOVE this idea from Southern Living‘s recent article about decorating with pumpkins: floating pumpkin votive holders. Here’s the photo from the article. I would love a big glass bowl of these for a party! I love you page. I came across it looking for some craft ideas..